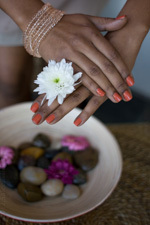 Exceptional services to invigorate and restore the health and beauty of your nails. Asterick * denotes specials going on now. Relax and enjoy a refreshing manicure service to give your fingernails a professional, clean and tidy look. We will trim and shape your nails. Along with an invigorating hand massage and chemical-fee top-quality professional nail lacquer in your choice of opaque, pastel and neon colors. Be sure to inquire with our expert nail provider. An excellent service for time efficient patron. Includes cuticle care, shaping and polish.